Ryan T. Collier Photography LLC | Flooded. While I was at Panera Bread with a friend of mine, a pretty hefty storm blew through and completely flooded the parking lot! The power of water is an amazing thing. 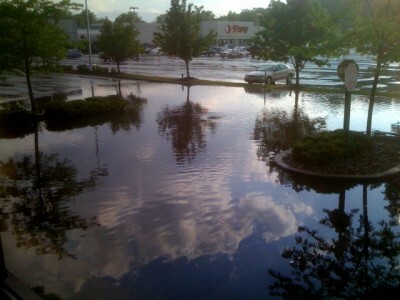 In about 15 minutes there was probably 8-10 inches of rain water flooding the huge parking lot! I started to think about an old schoolmate, Jamie, in Iowa who has had to deal with much larger flood waters. I can’t imagine what that is like – to be in a flood plain with water as deep as 7 feet. Crazy. After about 30 minutes, the skies had cleared and the sun was beaming down. Craig and I watched as all that water disappeared into the storm drains – which was pretty neat because the water made a little tornado-esque vortex as it drained. Neat-oh! Later tonight, when I got home, I decided to tackle my first relaxation technique for this week – meditation! It was a little weird at first, and took me a while to get settled in, but once I did it felt really good. I have to write a small lab report about it, so I’m not going to repeat information. But, it felt good – not only to cross it off my list of things to do, but physically, it was rejuvenating. I think after photographing an engagement session or taking wedding photos, I might implement a little meditation time afterward to refresh and rejuvenate my mind! The next time I’m hired as a wedding photographer, I’m going to try and work in some meditation time. Shooting weddings is very much a non-stop job – I concentrate on delivering the best and most creative wedding photos possible, that it’s simply difficult for me to slow down. Posted in Blog, Personal, Photography, Weather, Weddings and tagged with engagement session photography, flooding, meditation, Panera Bread, wedding, wedding photography. RSS 2.0 feed. « Mobile Rochester Wedding Photographs.